\Programmes\External Economic Relations\Conference: Opening of Chapter 30 – What lies ahead? Conference: Opening of Chapter 30 – What lies ahead? As a part of its project “Monitoring and supporting Serbia’s pre-accession negotiations with EU in Chapters 30 and 31” ISAC has organised a conference on March 13, 2018 called “Opening of Chapter 30 – What lies ahead?”. 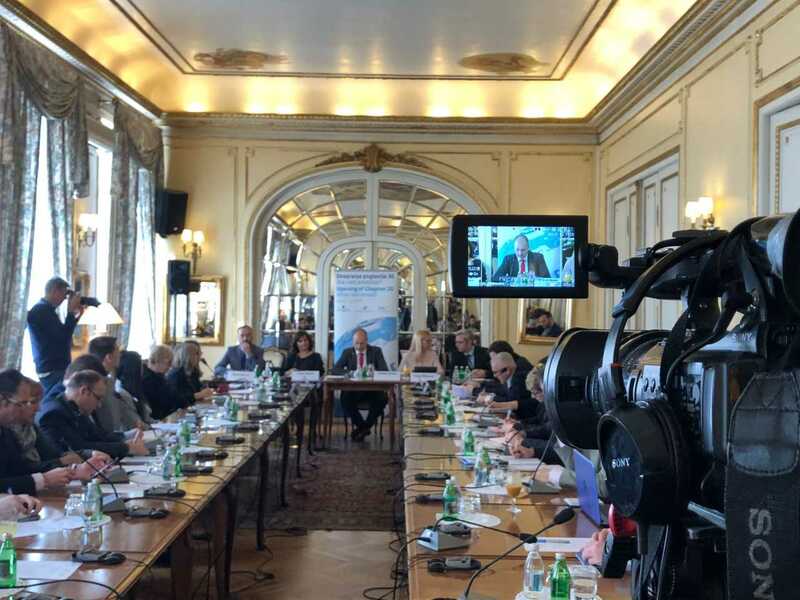 Participants of this conference included the representatives of Serbia’s negotiating team for the accession to the EU, representatives of the Serbian government, the European Union and other independent experts. Below you can find a short report of the conference and some of the key points presented. The Head of the Negotiating Team, Tanja Miščević, said there are two benchmarks for closing Chapter 30, which Serbia opened in December 2017. The first one is membership in the World Trade Organisation (WTO) and the second one is the adoption of an Action plan for compliance with legislation and international agreements with the EU acquis, as well as strengthening administrative and control capacities for its implementation. The EU, as well as every member state individually, are members of WTO; therefore, the EU requires that new member states also be in the WTO and to demonstrate a capability to act as one. Such evaluation takes at least a year, Miščević said. “It is in our best interest to become a member of WTO and I hope that discussions induced by opening chapter 30 would continue”. Discussion about membership in the WTO will undoubtedly raise different questions, which will possibly open up a serious political discussion about bilateral free trade agreements. Miščević reminded us of the possible 2025 perspective for the accession of Western Balkans countries and said that negotiations must be completed by 2023 in order to leave up to two years for Serbia and EU Member States to ratify all the necessary documents, and for Serbia to organise a membership referendum. We don’t have a lot of time to fulfil the criteria and conclude the negotiations for membership in WTO, Miščević warned. Tanja Dinkić, Secretary of the Negotiation group for Chapter 30 in the Ministry of trade, tourism and telecommunications, reasoned that by opening Chapter 30 the process of accession to the WTO should be faster. She stated that the screenings for both Chapters were done by 2014 and Serbia was prepared for negotiations in 2015. Dinkić also reminded us that Serbia agreed to abolish all the free trade agreements with third countries and cancel or amend agreements on economic cooperation that contained the most-favored-nation clause in order to join EU. Serbia has 127 agreements on economic cooperation with 90 of them containing that specific clause. Serbia can have bilateral agreements with third countries as long as those agreements have a clause stating they will expire the moment Serbia becomes an EU Member State and that those countries cannot seek compensation, Dinkić explained. Dejan Ralević, member of the Working Group for Chapter 30 of the Ministry of Foreign Affairs said that Ministry of Interior, together with them, will work on everything surrounding the topic of Humanitarian Aid and Development Policy. He also stated that the EU does not expect from new Member States to give the same amount as older Member States (0.7 GDP) and emphasised that Serbia is already giving a part of its GDP to humanitarian and development aid but it is not doing it systematically and in an organised way. Head of the European Integration Section of the EU Delegation in Serbia, Radica Nusdrofer, according to her personal estimation said that WTO membership should not be a big obstacle to overcome because Serbia has already done large part of the work, but it is not the same when it comes to public opinion, which could be a challenge. What lies ahead is abolishing the ban on the trade of GMO and concluding the negotiations with four WTO members – USA, Ukraine, Russia, and Brazil. EU legislation implies high control of GMO and complying with it Serbia would be more protected, Nusdrofer said. “You can rest assured that something is safe if it is authorised in the EU”. Since the law about GMO is the number one obstacle for Serbia in order to become a WTO member, Nusdrofer stated, “To authorise controlled trade of GMO is better than having an absolute ban and having no control, which is the current situation in Serbia”. Furthermore, she went and explained that only trade of GMO is prerequisite for membership in the EU, not production of GMO products. Olivera Jocić, Assistant Minister for trade, tourism and telecommunications, said that Serbia has started negotiations with the WTO in 2005, was supposed to become a member in 2011 but the negotiations were practically suspended after the last meeting of the Group for negotiations in 2013. She stated how absurd is to talk about membership benefits in the organisation of its size, where 164 countries are already members and the only countries from the European continent which are not members are Serbia, Bosnia and Herzegovina and Belarus. Even though Serbia has covered the vast majority of its trade with free trade agreements, Jocić continued explaining how Serbia does not have a functional mechanism, for settling trade disputes, which exists in WTO. Membership would allow Serbia to fight against unprincipled actions in world trade.